He and his wife, Tania, have one son, Gerardo Jr., and one daughter, Aaliyah Victoria. Appeared in 142 games with Colorado, his highest total since appearing in 155 games with Milwaukee and Baltimore in 2015... Finished the year with a .342 OBP, his highest mark since a career-best .357 OBP in 2011 with Arizona...Had a .393 (11-for-28) clip as a pinch-hitter, the third highest average in the National League...His .326 (31-for-95) average with RISP was the ninthbest average in the NL...his .366 clip with RISP from May 1 through the end of the regular season led the NL...Batted .354 (28-for-79) in June, the third-highest average in the NL during the month...hit safely in 18 of his 24 games...his 22 RBI during June were tied for fourth-most in the NL...His .321 road batting average from May 2 through the end of the regular season was eighth-best in the NL...Made 90 starts in left field and seven in right field. Recorded .309 batting average (121-for-392) over 115 games for the Rockies … clip the second-highest mark of his Major League career behind his .328 average in 2015 with Milwaukee ... Among players with 400 or more plate appearances, his .309 average ranked ninth in the National League ... Reached base in 10 consecutive plate appearances across three games from July 17-19 … became the sixth player in franchise history to reach base in at least 10 consecutive plate appearances ... Batted .443 (27-for-61) in July, the highest batting average for the month in the National League and the highest batting average for the month of July in Rockies history ... Placed on the 10-day disabled list on June 7 with a strained right quad and was reinstated on July 7 ... His 10 home runs were tied for the second-most home runs in a single season in his career (also: 2010) ... Made his second career postseason appearance in the National League Wild Card game on Oct. 4 … went 2-for-4 with one run and one RBI. Batted .253 (93-for-368) with 27 doubles and 39 RBI over his first season with the Colorado Rockies...Played in a career-low 102 games in his first season with the Rockies...Had a career-high-tying three double on Opening Day, April 4 at Arizona … was 3-for-5 in the opener...Appeared in 19 games at first base with 16 starts, his first career appearances at first base...Played in his 1,000th career game on April 18 vs. Cincinnati...Had 13 RBI in April … drove in 12 runs in May...Made his first career stint on the disabled list with a sprained left ankle June 17, reinstated Aug. 7...Prior to his stint on the disabled list on June 17, was tied for third in the National League with 20 doubles. Was traded to Baltimore July 31 after batting .328 (106-for-323) for the Brewers prior to the trade deadline. Began the season with Milwaukee, and ranked fourth in the NL in batting average (.328) when he was traded to Baltimore in exchange for right-handed pitcher Zach Davies on July 31. Recorded a career-high tying five hits (5-6, 3 R, 2B, HR, 3 RBIs), Aug. 16 vs. Oakland. Hit safely in 14 consecutive games across both leagues, July 17-Aug. 1, and batted .453 (24-for-53) with 14 runs, five doubles, three triples, one home run, four RBI, six walks and three stolen bases over that span. Became the 1,000th player in Orioles franchise history upon making his debut with Baltimore Aug. 1. Won his second NL Rawlings® Gold Glove Award (fi rst as a right fi elder) after establishing a club record with a NL-best 17 outfi eld assists…also led all outfi elders with 41 defensive runs saved and a 31.1 ultimate zone rating... Named NL Wilson Defensive Player of the Year... According to fangraphs.com, the 41 DRS were the most since 2002 and the 31.1 UZR was the second-highest since 2002 behind Alfonso Soriano's 33.2 in 2007... Set career highs in home runs (10), doubles (43), walks (48) runs scored (79), games (156), hits (161) and at-bats (601) and defensively in assists (17)... Tied for third in the NL in doubles, 2 more than his total from 2011-12 combined (41)…43 doubles tied for seventh-most in club history with Paul Goldschmidt (2012)... Selected as the D-backs Heart & Hustle Award winner... Tied club record with 3 doubles on Opening Day vs. Cardinals (20th time)... Hit leadoff home runs on April 3 vs. Cardinals, May 12 vs. Phillies, May 18 @ Marlins and June 1 @ Cubs... His leadoff homer on the first pitch of a 1-0 win on May 18 @ Marlins was the fi rst time a player went deep on the fi rst pitch of the game for the only run since Sept. 14, 1993 @ Marlins (Pirates' Carlos Garcia leadoff homer)... Collected 11 doubles in Sept., the most by a D-back in a month since Aaron Hill in Sept. 2012... Appeared in 3 World Baseball Classic games with Venezuela and was hitless in 8 at-bats. Hit .273 (105-for-385) with 21 doubles, 2 triples, 7 homeruns and 36 RBI in his fourth season with the D-backs...tied a career high in stolen bases(15), doubles and established a career high in sacrifice hits(6)...Made 90 starts (44 in center field, 33 in left and 13 inright)...recorded 8 outfield assists...Combined to bat .309 (63-for-204) from the No. 1-2 position in the lineup...Totaled 6 home runs and 25 RBI prior to the All-Starbreak, compared to 1 and 11 in the second half...Hit a monthly-best 4 home runs in June...batted amonthly-high .361 (22-for-61) in July...Slugged first grand slam and tied career high with 4 RBIon April 22 vs. Braves (4th time). Received his first National League Rawlings® Gold Glove Award as a left fielder after posting an overall .993 fielding percentage (2 E in 281 TC) with 12 assists...the 12 outfield assists tied with the Rockies' Carlos Gonzalez (12) for tops in the NL and tied with Eric Byrnes (2007) for most in single-season club history...Made 135 appearances in the outfield (125 in left field, 14 in right and 2 in center) and recorded a .990 overallfielding percentage (3 ER in 303 TC)...Established career highs in several offensive categories, including batting average (.292), on-base (.357) and slugging percentage (.427), home runs (8), stolen bases (15) and walks (43)...Tied for fourth in the NL with 16 intentional walks and tied for seventh with 8 triples...the 16 intentional walks were the third-most by a D-backs players in a single-season behind Luis Gonzalez (24 in 2001 and 17 in 2003)...Was 15-for-16 in stolen base attempts, the second-best percentage (93.8) in the Majors (min. 15 SB) behind the Rangers' Craig Gentry (18-for-18)...Led all Major Leaguers with a .330 average (86-for-261) from the No. 8 position in the lineup...Went 2-for-5 with a RBI double in his first career Opening Day start on April 1 @ Rockies...Threw out a pair of Braves' baserunners at third base in the sixth inning on May 18 vs. Braves...according to Elias Sports Bureau, became the first outfielder in franchise history to accomplish the feat...According to Elias, his 2 bunt hits on May 21 vs. Twins marked the third time in club history a player has accomplishedthe feat, joining Tony Womack on June 3, 2003 vs. White Sox and June 15, 2003 @ Twins...POSTSEASON: Hit .056 (1-for-18) with 1 double in 5 NLDS games vs. Brewers. Broke camp on the Opening Day roster for the first time in his career and spent all but 10 days in the Majors...saw action in a career-high 133 games while compiling a .261 average (95-for-364) with 3 homers and 30 RBI...Defensively, set career highs with a .983 fielding percentage and 9 outfield assists, which ranked tied for sixth amongNL outfielders...saw playing time at all three outfield spots with 76 games (63 starts) in left field, 7 games (3 starts) incenter field and 36 games (27 starts) in right field...Primarily served as the fourth outfielder to begin the season until left fielder Conor Jackson went on the disabled listwith a hamstring strain on April 19...made 14 starts in the outfield, including 12 in left field and 2 in right field, overan 18-game span from April 19-May 7...Was optioned to Triple-A Reno on May 8 when Jackson returned from the disabled list...hit safely in all 9 games (.417,15-for-36) for the Aces from May 9-18 before being recalled on May 19...Started 10 games in the outfield during a 24-game span from May 19-June 13 prior to Jackson being traded to theAthletics on June 15...played in 90 of the club's final 98 games of the season after the trade, including 67 starts in theoutfield...His first career inside-the-park home run (seventh in team history) was a 2-run blast in the eighth inning that propelledthe D-backs to a 2-1 win on June 9 vs. Braves...the homer snapped a 312 at-bat homerless drought...Matched his career-high with 4 hits on July 8 vs. Marlins...Hit .313 (41-for-131) with 8 doubles, 2 triples, a homer and 10 RBI over his final 45 games from Aug. 11 through theend of the season. Produced a solid rookie campaign after a mid-May promotion to the Majors, batting .290 with 5 home runs and 60 RBI in 120 games for the D-backs...Among NL rookies, ranked second with 132 hits, 60 RBI and 8 outfield assists; tied for second with 36 multi-hit games; tied for third with 8 triples; fourth with a .290 batting average and 184 total bases; tied for fifth with 59 runs scored and 21 doubles; seventh with 34 extra-base hits; ninth with a .404 slugging percentage; and 10th with a .324 on-base percentage and 5 stolen bases...among all rookies, ranked second in hits; tied for second in multi-hit games; third in RBI and outfield assists; tied for third in triples; fourth in batting average and total bases; tied for sixth in runs scored; tied for seventh in doubles; and 10th in extra-base hits...Entered the season ranked by Baseball America as the 88th-best prospect and 12th-best center field prospect in baseball...at season's end, ranked as having the Southern League's Best Outfield Arm...Put 21.5 percent of pitches in play, tied for the 39th-best average in baseball...His .337 average (34-for-101) with runners in scoring position tied for 16th-best in the Majors...Hit .310 (110-for-355) against right-handers and .220 (22-for-100) versus southpaws...Posted a .305 average (60-for-197) in 54 games at Chase Field and a .279 clip (72-for-258) on the road...Excelled in the clutch with a .367 average (72-for-196) with runners on base against a .232 average (60-for-259) with no runners on base...his .135 increase ranked second in the Majors (min. 400 PA) behind San Diego's David Eckstein's .137 differential (.340 with runners on vs. .203 with bases empty)...From the seventh inning on, batted .323 (50-for-155) while hitting at a .273 clip (82-for-300) over the first six frames...Opened season at Double-A Mobile, hitting safely in 22 of 29 games at a .361 clip (39-for-108) while reaching base via a hit or walk in 26 games and batting .442 (19-for-43) with a 1.331 OPS with runners on base...For the BayBears, hit .390 (30-for-77) with a 1.035 OPS against righties...Selected from Mobile on May 13...at the time of his promotion, his .361 batting average was the fourth-highest in the Southern League while his .469 on-base percentage ranked second...Hit safely in his first 5 games from May 13-20 (game No. 1) at a .409 clip (9-for-22) with 2 triples, 1 home run and 7 RBI...Reached base via a hit or walk in his first 17 games, batting .319 (23-for-72) with a .367 on-base percentage and .486 slugging percentage...Reached base via a hit or walk in 23 of his first 25 home games, batting .324 (33-for-102) with .358 on-base and .520 slugging percentages...Homered in his first Major League plate appearance on May 13 vs. Reds, becoming the second D-back and 100th Major League player all-time to accomplish the feat...Collected a RBI in each of his first 5 games, joining the Expos' Mike Lansing (1993) to become only the second player in the last 30 years with at least 1 RBI in each of his first 5 games... Named the NL Rookie of the Month for May after hitting .319 (22-for-69) with a .360 on-base percentage and .493 slugging percentage over 16 games and leading all NL rookies with 3 triples and 16 RBI... Had a career-high 4 hits on July 4 @ Rockies and Aug. 6 @ Pirates... Had a career-best 4 RBI on July 26 vs. Pirates... Had a career-high 10-game hitting streak from July 29-Aug. 8, batting .442 (19-for-43) with .457 on-base and .558 slugging percentages... Hit safely in 9 straight road games from July 31-Aug. 8 at a .429 clip (18-for-42) with .444 on-base and .524 slugging percentages... Had a walk-off, RBI single in the 10th inning of a 4-3 win on Aug. 15 vs. Dodgers... Hit a team-leading .314 (27-for-86) over his final 28 games from Sept. 1-Oct. 4... Played for Venezuela in the World Baseball Classic, hitting .111 (1-for-9) with 2 runs scored, 1 walk, 1 stolen base and a .311 OPS in 6 games... Following the season, played for Aguilas del Zulia in the Venezuelan Winter League...in 18 games, hit .333 (24-for-72) with 3 doubles and 11 RBI. Batted .286 with 22 doubles, 10 triples, 6 home runs and 28 stolen bases in a combined 123 games at Single-A Visalia and Double-A Mobile...At season's end, ranked by Baseball America as having the Southern League's Best Outfield Arm...Went 4-for-4 with a run scored and RBI on April 7 at Lake Elsinore...Hit safely in 13 straight games from May 7-21, batting .352 (19-for-54) with 7 runs scored, 4 doubles and 4 RBI...promoted to Double-A Mobile on May 31 and strung together a 7-game hitting streak from June 2-8, batting .385 (10-for-26)...Had a season-high 12-game hitting streak from July 8-26, batting .333 (14-for-42) with 9 runs scored and 8 RBI. Appeared in 134 games with Single-A South Bend andVisalia, batting .313 (171-for-546) with 27 doubles, 5 triples, 8 home runs, 71 RBI and 26 stolen bases...Led the Midwest League with a .320 average (142-for-444) and was named to the ML postseason All-Star Team...Was the ML Player of the Week from June 4-10 and named the D-backs' organizational Player of the Month for June...Ranked by Baseball America as the ML Best Batting Prospect and Best Outfield Arm following the season. Hit .328 (89-for-271) with 18 doubles, 4 home runs and 43 RBI in 69 games with Advanced Rookie Missoula...Ranked ninth in the Pioneer League with a .328 average and tied for the league lead with 89 hits. Led the Dominican Summer League with a .384 average(91-for-237) in his first professional season. March 28, 2019 San Francisco Giants selected the contract of OF Gerardo Parra from Sacramento River Cats. 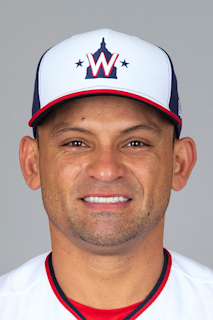 February 14, 2019 San Francisco Giants signed free agent LF Gerardo Parra to a minor league contract and invited him to spring training. February 14, 2019 OF Gerardo Parra assigned to Sacramento River Cats. October 30, 2018 LF Gerardo Parra elected free agency. April 26, 2018 Colorado Rockies activated LF Gerardo Parra. April 22, 2018 LF Gerardo Parra roster status changed by Colorado Rockies. July 7, 2017 Colorado Rockies activated LF Gerardo Parra from the 10-day disabled list. July 4, 2017 Colorado Rockies sent CF Gerardo Parra on a rehab assignment to Albuquerque Isotopes. June 7, 2017 Colorado Rockies placed LF Gerardo Parra on the 10-day disabled list. Strained right quad. April 17, 2017 Colorado Rockies activated LF Gerardo Parra from the paternity list. April 14, 2017 Colorado Rockies placed LF Gerardo Parra on the paternity list. August 7, 2016 Colorado Rockies activated LF Gerardo Parra from the 15-day disabled list. August 1, 2016 Colorado Rockies sent LF Gerardo Parra on a rehab assignment to Albuquerque Isotopes. July 29, 2016 Colorado Rockies sent LF Gerardo Parra on a rehab assignment to Hartford Yard Goats. January 20, 2016 Colorado Rockies signed free agent LF Gerardo Parra. November 2, 2015 LF Gerardo Parra elected free agency. July 31, 2015 Baltimore Orioles activated LF Gerardo Parra. August 1, 2014 Milwaukee Brewers activated LF Gerardo Parra. November 15, 2013 OF Gerardo Parra assigned to Leones del Caracas. November 3, 2010 CF Gerardo Parra assigned to Aguilas del Zulia. May 19, 2010 Arizona Diamondbacks recalled RF Gerardo Parra from Reno Aces. May 8, 2010 Arizona Diamondbacks optioned Gerardo Parra to Reno Aces. October 8, 2009 OF Gerardo Parra assigned to Aguilas del Zulia. May 12, 2009 Arizona Diamondbacks selected the contract of Gerardo Parra from Mobile BayBears.